Hi all, Just a quick post to hi. 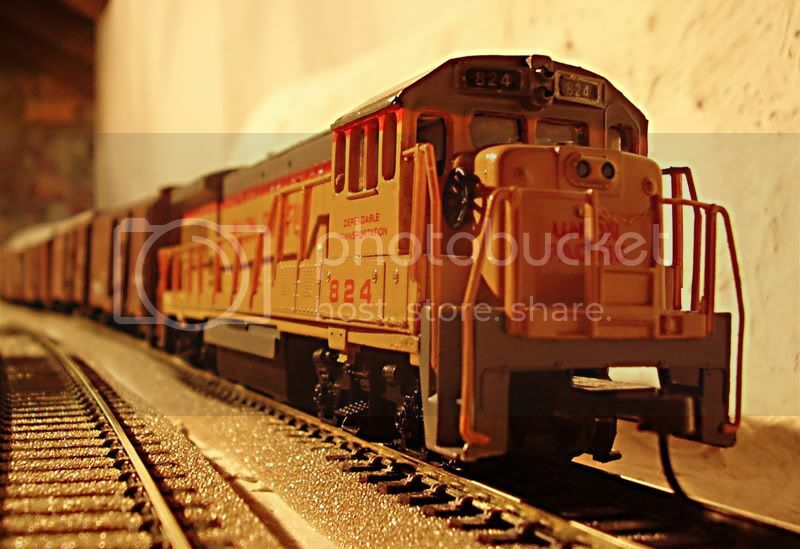 I bought my first train set last week and im in to photography, with a canon 450d. Still new to both and will be building my model railway for photography and enjoyment reason. Here is a quick picture from the set straight out of the box, I know most photography is done with a high F stop but this was done with a low F stop to blur the wagon. Your thought would be helpful as its my first time trying model railway photography. With it being a steamer i thought sepia might be better instead of color due to the track mat colors. Were you photographing it as a model, or attempting to make it look more like the real thing? If it was the latter, you'll probably be wanting a larger depth of field. Another thing worth trying, is to get the camera lower in order to emulate being at the height of a person at that scale, which will tend to make the thing look more realistic. Of course it is not always possible to get the camera very low down, but what you can do instead is shoot level and then crop out the top, which gets a similar effect. Adding some noise or film grain in Photoshop or similar also tends to make things look more convincing and of course with Photoshop or some other similar editing software, you can clone out things which give it away as being a model, such as the coupler on the front of the loco. Another thing to try with railway photography, is to get the railway line to come out of the shot at the corner of the frame, which has the effect of drawing the viewer's eye into the shot, which can often enhance L compositions if you are using the rule of thirds. Thanks Chock for the great reply. Q. Were you photographing it as a model, or attempting to make it look more like the real thing? A. Well i was trying to combine the 2 to try make the model look more realistic. Q.Another thing worth trying, is to get the camera lower in order to emulate being at the height of a person at that scale, which will tend to make the thing look more realistic. A. my chin was on the floor looking through the viewfinder, Might try have it on a table next time to get the level better. A. I was thinking along those kinda of lines that's why i thought sepia. Didn't think of grain tho. Q. you can clone out things which give it away as being a model, such as the coupler on the front of the loco. Q.with railway photography, is to get the railway line to come out of the shot at the corner of the frame. A. i thought i had the framing right for this, I will try placing the track in the corner more next time if its on a curve. 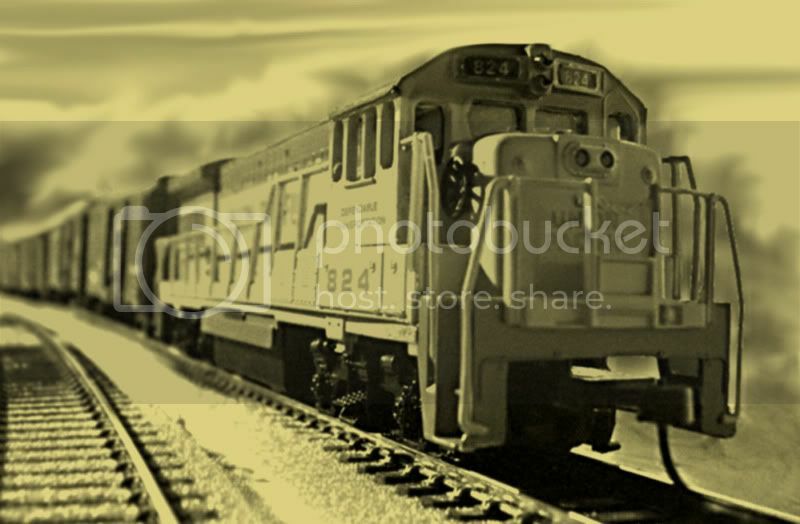 I have a lot to learn in photography and railway models, and i hope to learn a lot from browsing these forums. The trick with cloning in Photoshop is to drop the opacity and flow settings for the brush to about 50 percent and to use a soft edged brush. This allows you to use more than one source point instead of staying with the same one for the entire edit. That way, you gradually get rid of the bits you want to lose and avoid an obvious 'rubber stamp' effect; a useful keyboard shortcut when doing that stuff is the left and right square bracket keys, which will let you adjust the brush size on the fly - left square bracket for a smaller brush, right one for a bigger brush.